Violet color. Herbal, fruity aromas and flavors of blueberries, eucalyptus, chocolate mint, and menthol with a satiny, tangy, fruity medium-to-full body and a tingling, charming, medium-length finish with suggestions of cassis pie, vanilla gelato, and cedar pencil shavings with firm, grippy tannins and heavy oak flavor. A rich oaky cabernet that could use some time to open up. Bottom Line: A rich oaky cabernet that could use some time to open up. 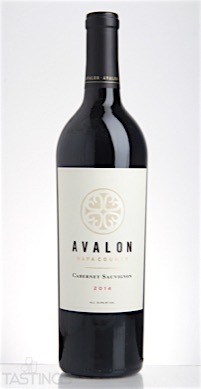 Avalon 2014 Cabernet Sauvignon, Napa County rating was calculated by tastings.com to be 93 points out of 100 on 7/28/2016. Please note that MSRP may have changed since the date of our review.